I’ve been reading a new book since I very quickly finished Reimagining Evangelism: Inviting Friends on a Spiritual Journey. 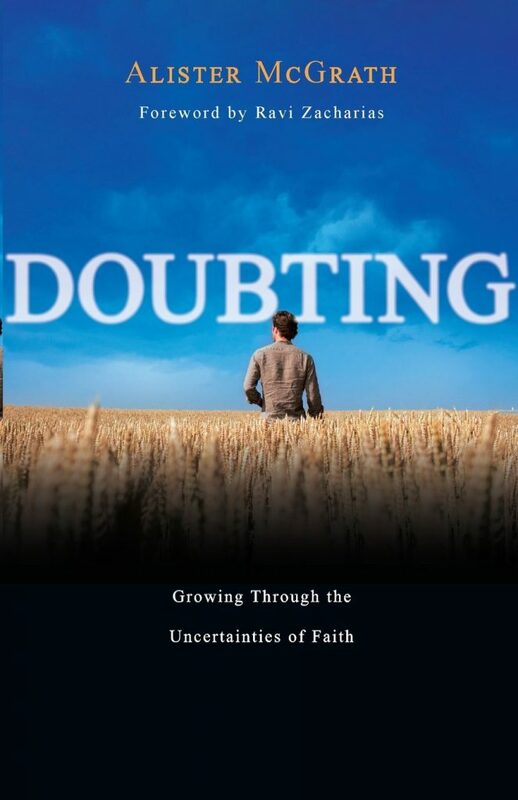 This new book, Doubting: Growing Through the Uncertainties of Faith, by Alister McGrath, speaks of the presence of doubt in our Christian walk, but also during the conversion process. He raises excellent points about the role of doubt in our evangelism. Doubt, he writes, is part of our human nature. It’s not skepticism, nor is it unbelief. Rather, its a difficulty understanding. Skepticism is willful doubt as a matter of principle. Unbelief is a decision not to believe, but doubt exists in the absence of information, when we have an incomplete understanding. In our conversion experience journey, some of us likely had lots of doubts to overcome. We wanted to gather as much information as possible to know that we were making a rational evaluation of the evidence and consequences of accepting Jesus into our life. We searched intently for answers until we had enough doubts settled to commit ourselves fully to following the Lord. Here, doubt was a major obstacle to coming to faith. Others of us may have had a powerful encounter with the Lord, decided to follow him, and then begin to wrestle with the truth of it all. The experiential encounter was enough to allow us to risk everything without full knowledge of what we were getting into. The character of God that we discovered in that encounter revealed enough to us to trust Him for everything else, and sort it out as we mature in faith. Here, doubt becomes a partner in the journey of faith. Ultimately however, to believe in God demands faith. To accept Christ into our lives demands faith. To accept Christianity as true demands faith. Becuase faith is required, doubt will exist in our life. “Faith is not belief without proof, but trust without reservations — a trust in God who has shown himself worthy of that trust.” — McGrath. “Faith needs the vitality of experience if it is to live — and the support of understanding if it is to survive.” (McGrath, p. 31). As evangelists, we have to deal with doubt in our own life, and in the life of people we share with. 1. First, we deal with our own doubt. Do we really believe what we share, what we proclaim? How active is your relationship with the Lord? Do you have the “vitality of experience” that supports your belief in the gospel? Or is what you share some one else’s script? We want to be authentic in our sharing, and your owned lived experience in your relationship with the Lord is the most authentic of testimony. How can we truthfully proclaim that we know we are forgiven with we question the truthfulness of that statement in our own heart? Sure we can proclaim it because its part of the gospel content, as a propositional idea. But, can we share it with conviction because we believe it ourselves? If we doubt our own forgiveness, or our own hope for life after death, or even the love of God for us in Christ, I’m not sure we can proclaim it ourselves convincingly. The problem is not the gospel itself, it’s our doubt in its validity for us. 2. We have to deal with doubt in the people we share with. As mentioned, doubt can be a hurdle to overcome that keeps a person from committing to Jesus Christ, or doubt can cause people to question their initial commitment. Again, the problem is not with the gospel itself, but with our inability to see what God is doing with the seeds we plant. The seed works in secret, the problem is not with the seed itself. As evangelists, we help people along in their journey to Christ, planting seeds as prompted by the Lord. Some will fall on good ground, others will be eaten by the birds. The problem is not the seed, its the soil. Great post…have been thinking a lot along the same lines, you have just articulated what my brain is processing! !